If I say the word 'peony' to you, what is the first thought or picture that pops into your head? Are you a little girl in your mom's flower garden? Or your grandmother's? Are you burying your nose in one of these old-fashioned blossoms hoping you don't sniff in an ant by mistake? Relishing that heady scent that you can't quite describe? What about feasting your eyes on the colourful bouquets sitting regally atop a laced covered table at a wedding or bridal shower? For me, I just have to catch the faintest whiff on a breeze and I'm a young girl off with her mom (and younger sisters) to a bridal shower. I loved bridal showers as a girl. The excitement of watching the bride-to-be opening her gifts from well wishers, the laced covered dining table festively decorated with pretty china and vases of peonies just picked from the garden (whoever heard of using flower shops out in the country in the early 1960's). I suppose wedding showers were held at other times of the year too, but in my mind's eye, all bridal showers were held in June when peonies were at their peak. Many gardeners grow peonies for sentimental reasons. These old-fashioned flowers may remind them of their childhood or a grandmother's garden. 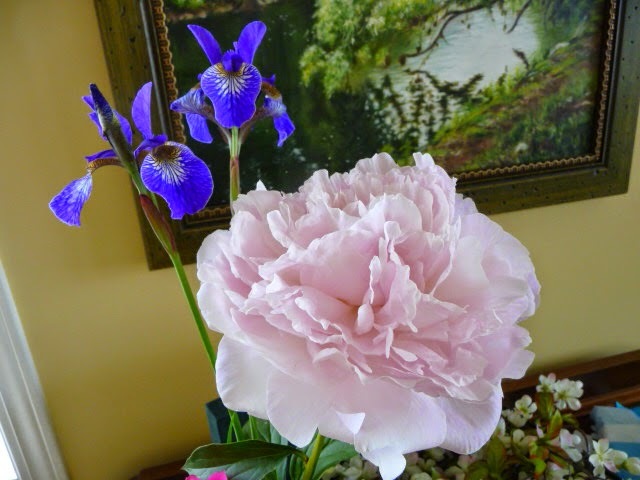 Peonies are lovely in the garden or as cut flowers indoors. Their fragrance varies, depending on the cultivar, as well as the time of day. Peonies are most fragrant in the morning before their volatile oils dissipate with the heat of the day. So... did you know that peonies are most fragrant in the morning before their volatile oils dissipate with the heat of the day? I don't think I knew that (before I Googled), but I'm going to check it out in the morning. This beauty was picked late afternoon when I saw its petals unfurled. The fragrance is filling the house. One single blossom. I'm Swooning! 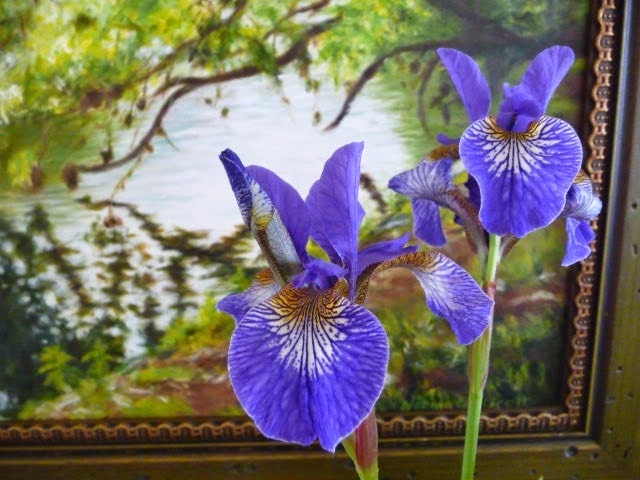 On a different vein, my Siberian irises were begging for a pose of their own, so below I give you this pair of lovelies ... as they coyly blend into the oil painting I used as a background for the photo. Aren't they exquisite? Truly, my glimpse of heaven in an unexpected moment. For early this morning when we arrived home from work at eight a.m., the peonies were still in bud form. The warm sunshine surely coached them into showing off today. "... and they open --- pools of lace, white and pink... "
Oh, my, what a beauty she is! And you can never go wrong with irises. Exquisite! I knew nothing of peonies until I bought my first home and there were several bushes. I had no idea what I had and they were mown down in short order. What a nitwit I was! The irises and that painting is a beautiful idea! Lovely! She gives her heart of beauty -- for the healing of my soul. The medicine for heartache That lurks in lovely things. Oh, yes, Brenda. Your peony is definitely swoon-worthy. Soooo lovely. Our white and deep raspberry colored ones are out now, too. Absolutely breath-takingly beautiful!! Our peonies are out around Memorial Day in May!! Love them! I think peonies are my for-real-favorite flower. NOTHING smells as much like the very best of childhood... and people younger than I (a baby boomer) feel the same way. Peonies are graceful and so wonderfully old fashioned. Thank you for sharing such a treat. Thank you for dropping in on my blog. Peonies are one of the most beautiful flowers, it's a shame the season is so short-lived. I've never smelled any though. I'll have to do something about that. Your peony is absolutely stunning! They are easily my favorite flower (though hydrangeas run a close second). When I was growing up, we had the deep red ones. One look at those ones and I am back in my childhood home. For me when I think of the work peony, it is the oh... so... fragrant smell. The colors are almost as wonderful. 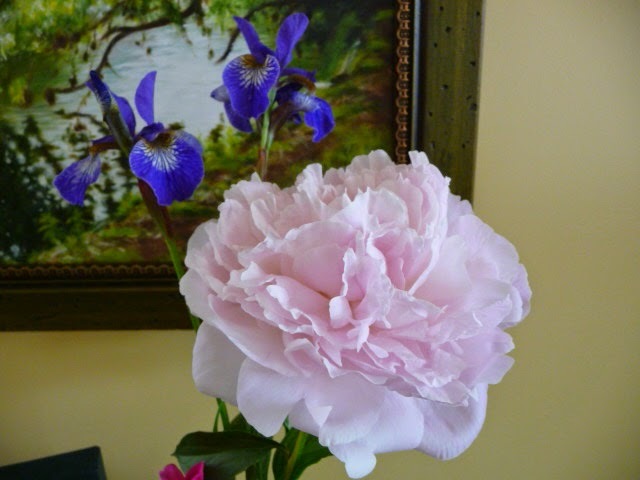 So when you throw in a Peony and an Iris, it's very close to perfection. 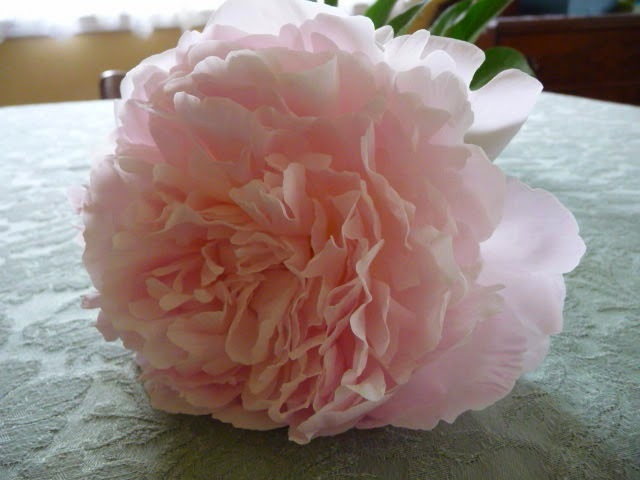 Your peony is exquisite, all pale ruffles and pink softness. What a lovely, lovely specimen. Its beauty is one that can make the heart ache with longing for something beyond earth. Oh peonies...their beauty and their scent! When I think of peonies, I picture driving past old farm houses that have rows of peonies swaying in the breeze. It seems peonies like lilacs bushes, were main-stays of the farmhouse garden. This is such a beautiful post. I love how you open with a bit of nostalgia; it's both personal and universal, bringing us back to a simpler time. And yes, your irises are truly exquisite!